Babies love to play with the labels on their toys and a blankie often comforts a baby. Those two characteristics led to the development of the cuddly blankie Label-Label. 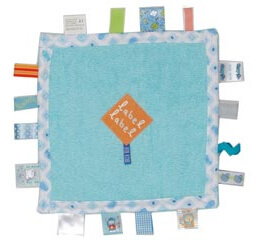 The Label-Label blankie has several functions: smell, cuddle, play, stimulate, and comfort. The original blankies are available in white, blue, pink and lime. The blankets are trimmed with a selection of labels sewn onto each edge; they have different fabrics, colors and images, which make it more interesting for your baby to feel and play with. The German based company added some new additions with bird and farm sized blankies, round and yellow blankies, playmats, princess and knight themed blankies and half-round blankies with a special label to attach another half-round blankie.